I envisioned this as a massive stuffed grape leaf — OK, more like 30 leaves, to be precise. 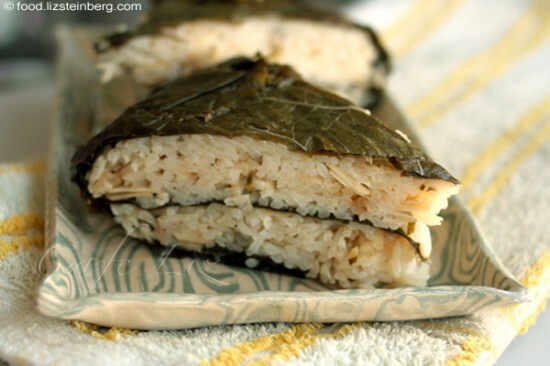 The grape leaves encase a loaf of seasoned rice, giving you the flavor of stuffed grape leaves but saving most of the time it would take to stuff each leaf individually. Obviously, it’s not a replacement for individual stuffed leaves, but this grape leaf pie tastes good in its own right, and I have no problem going through, say, half of it in one sitting when I didn’t invest painstaking work in creating each and every bite-sized piece. There are a few ways to go about an endeavor like this. The most critical part about cooking grape leaves is getting them soft enough so that they don’t offer resistance when you bite into them. You could cook the grape leaves for an hour beforehand, or you could bake the pie for an extra hour. 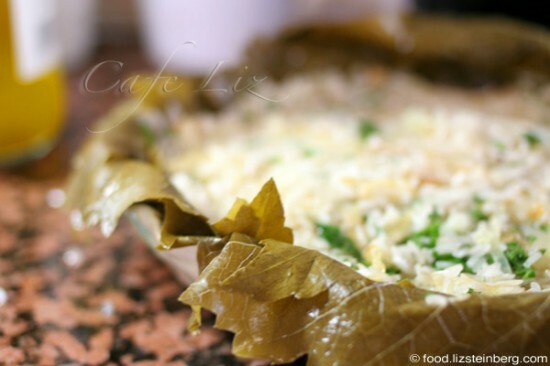 Neither method is perfect: The first adds an extra step to what’s supposed to be an easy dish, while the second increases the chances that the grape leaves will dry out and become crunchy. So, decide whether you want to go the effort of the extra step, or if you don’t mind your grape leaves coming out a little tough. They taste good either way. 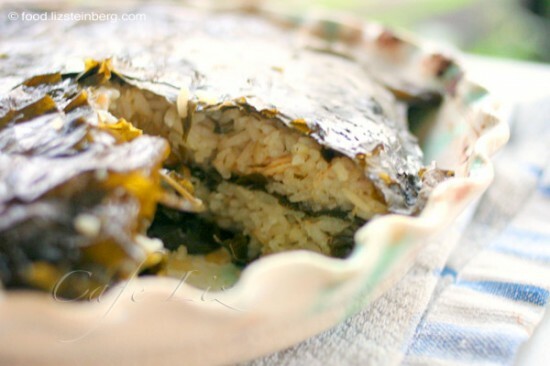 Yet another option is making this maklubeh style — layering your grape leaves in a pot/pressure cooker and cooking on the stovetop, with a glass plate on top of the rice/leaves to keep everything in place while boiling. Cook for 1.5 hours in a pot, or 30 minutes in a pressure cooker. When the dish is done, you flip the pot upside down and release the contents onto a plate. I didn’t try this, mostly because I feared the last step would go wrong, leaving me with a mound of rice, not a neat pie. I used a 20-centimeter (9-inch) dish. You could use whatever size dish you like, though; the depth of the pie simply will vary accordingly. My pie was about 3 centimeters deep. Optional: Rinse the grape leaves, and cook in 2-3 cups of water for an hour in advance (or 20 minutes in a pressure cooker). Remove the grape leaves from the water and let cool until they can be handled. Save the water to cook the rice. Heat the oven to 180 degrees Celsius/325 Fahrenheit. Thinly slice the onion, and fry it in a pot along with the pine nuts/almonds in the 1/4 cup olive oil, until the onion is translucent. Add the rice, salt, allspice, parsley and lemon. Rinse the grape leaves (if they haven’t been cooked yet). Line the bottom and sides of a pie pan with two layers of leaves, letting them hang several inches over the side of the pan — they’ll be folded upward to cover the top. Spread half the rice into the grape leaf bed. Spread another layer of leaves on top of that rice — again, about 2 leaves thick — and then top with the rest of the rice. Place a few grape leaves on top of the pie, fold the leaves hanging over the sides of the pan upward over the pie as well, and top with a few more grape leaves. 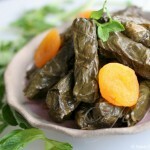 Pour 2.5 cups of hot water into the dish (use the cooking water from the grape leaves if you’ve already cooked them). Cover the whole thing with tinfoil or a lid, in order to keep the moisture inside as it bakes. Bake in the oven for half an hour if your leaves were precooked, or an hour and a half if they weren’t. Make sure there is still some moisture in the pan as it cooks. If your water evaporates entirely and the grape leaves on the top of the pie dry out, no worries: Flip the grape leaf loaf, add some more water into the pan, cover and stick back in the oven. You can eat this as soon as it’s cool enough, but it cuts more neatly once it’s had a few hours to sit. The photo at the top of the post was achieved after the pie had sat for a day. 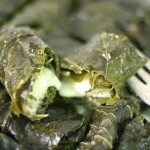 4 Responses to "Grape leaf pie"
Really cool twist on the classic stuffed grape leaves, which is one of my favorite foods. I’m interested to see if the Maklubeh style would work or if it would leave you with a mess as you fear. Wow… I love the recipe, the pictures, the concept! 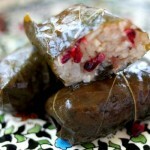 I have to hunt down some fresh grape leaves so that I can try this. I’m always googling for new pressure cooker recipes, which is how I got here, and this is the first time in a while that I find something exciting. Thanks, Laura! If I didn’t mention it, I actually used cured grape leaves, not fresh ones. Should be easier to find at this time of year. I love using my pressure cooker when I make stuffed grape leaves, it cuts down the cooking time from 1.5 hours to 30 minutes! A pressure cooker probably would be great for the maklubeh-style method I mentioned.